It’s pretty sad when you have to set your alarm an extra 30 min earlier to look after your foot care, but at this stage in the walk it’s essential! With all our tootsies taken care of, it was time to hit the road! Up the hill and steps we went to rejoin the Camino path, and rather than backtrack a block or 2 to find breakfast, Dan felt we would find something on the way out of town! 8 Km later we feel be coffee and sustenance in the village of Ventosa, and that was with a 1 km detour!!! Delicious and much needed sustenance! 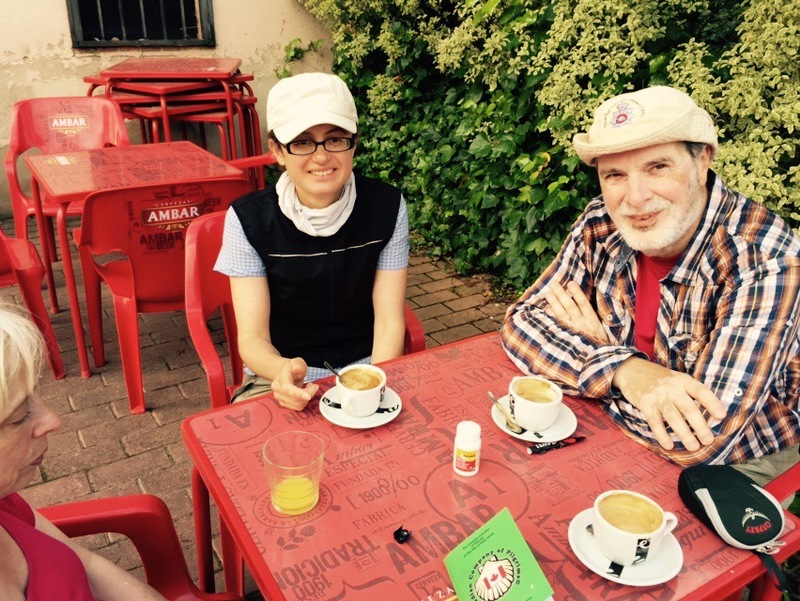 As you can see, aspirin is part of the Camino breakfast of champions!!! Shortly after breakfast we passed the following sign… Just goes to show you can’t trust those wineries for distance measurements!!! 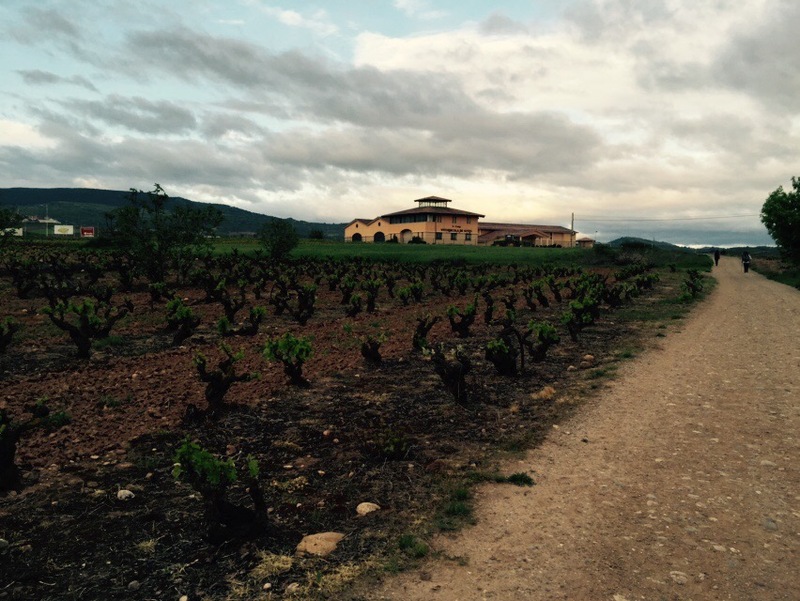 As you can imagine, the walk through the Rioja valley was filled with vineyards… Farmers active in cultivating the new crop beginning to spring from the vines! Back to our day… Our next major town was Najere… Beautiful medieval spot and full of activity in the core with a large festival going on in the streets and a wedding in the old church! What a wonderful and energizing place to walk through! Once we climbed out of Najere… Yes, if you don’t climb into a town, you most likely will need to climb out… We walked through a park then more vineyards before arriving at our Albergue in Azofra. We are staying in the municipal one, which offers double rooms only… One of the best on the Camino and certainly a bargain at €7 pp! Tonight, we will go into the village for dinner and then make a early night for our day tomorrow as we’d like to visit San Domigo on the way to our projected Albergue at Grannon… Not sure we’ll have wifi there, so may have to send a double entry the next day…. One of the reasons we are going there is that it has one of the most authentic pilgrim experiences… Mats on the floor( don’t worry, I will try the opposite end of things in Burgos in a few days with fluffy white towels and my own bath!!! My apologies for fewer pics… The wifi is not very strong here… Will write again when I can!!! My feet are feeling Dan’s pain. We are hoping Dan feels better soon!!! Alex, Oscar and I all send healing vibes! Love to you both. Ah, thanks sweetie! I’m looking forward to having him back on track, hopefully by Thursday… The next 80 are on my own..
Lionel and I have been reading these posts together at the end of each day and are having fun “tagging along” on your journey. We hope Dad gets back on his feet soon and is still able to enjoy the process in the meantime. Love you guys! Thx sweetheart… I can’t tell you how much that means to me! Dad is heading on to Burgos, so I’ll meet him there on Thursday! Love be you too! So sorry Dan! Hope your feet can heal so you can enjoy the rest of your trip. Pat, these images are so stunning! I hope you are taking time to just absorb the beauty surrounding you. It’s interesting, but all there is is time to absorb the beauty and the birdsongs… Next 80 k will be on mine own… Lots of reflection time then! Blessings to you both as you travel this path of spiritual delights. Healing prayers for Dan’s feet and expectant hopes for your fluffy white towels! Thx Myra! I’ll be leaving Fan today as he travels ahead 80 k… Hard to imagine that it will take 4 days to catch up!!! I’ve been thinking about that too!!! Maybe he could look really authentic and we could get him a horse!!! Thx so much!!! I have some good walking partners from Scotland and Germany… They’ll keep me going!!! Seems the entries above have said all i was hoping to say. Nan and i are really enjoying your amazing photos and posts. 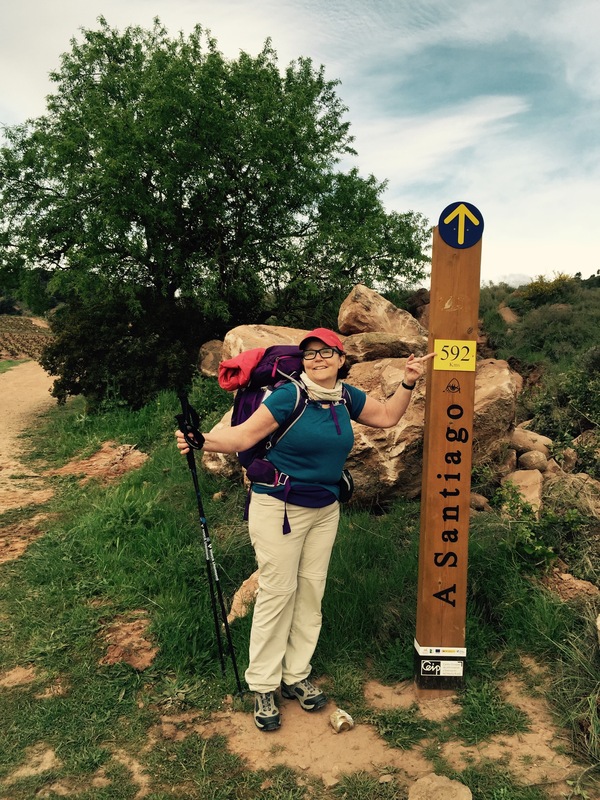 You both certainly have earned our highest admiration in doing this Camino! Thx Joe! It’s a real journey for both of us! Thanks for all your words of encouragement!